NEW ORLEANS – The outdoor season is off to a blistering start! 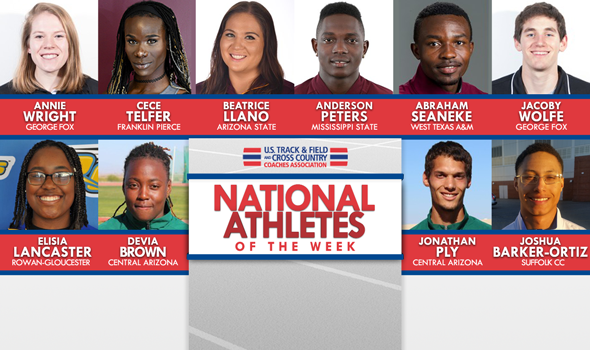 Here are 10 athletes who stood out the most during the past weekend in collegiate track & field and were named National Athletes of the Week by the U.S. Track & Field and Cross Country Coaches Association (USTFCCCA) for their efforts. Find out more about each of these athletes by clicking their names or scrolling below. National Athlete of the Week is an award selected and presented by the USTFCCCA Communications Staff at the beginning of each week to 10 collegiate indoor track & field athletes (male and female for each of the three NCAA divisions and the two NJCAA divisions that sponsor outdoor track & field). Nominations are open to the public. Coaches and sports information directors are encouraged to nominate their student-athletes; as are student-athletes, their families and friends, and fans of their programs. Nominated athletes are noticed before those athletes found through searching TFRRS. The award seeks to highlight not only the very best times, marks and scores on a week-to-week basis, but also performances that were significant on the national landscape and/or the latest in a series of strong outings. Quality of competition, suspenseful finishes and other factors will also play a role in the decision. Name the two men who have eclipsed the 271-foot barrier three or more times during their collegiate career in a collegiate season: Record-holder Patrik Boden and now Anderson Peters. This past weekend at the Al Schmidt Bulldog Relays, Peters launched the javelin 82.64m (271-1) on his first attempt to notch the 11th best mark in collegiate history. That mark fell just short of a collegiate PR for Peters, who won the NCAA title with a heave of 82.82m (271-8) last year. Peters has made a habit of being named National Athlete of the Week during the outdoor season in late March. He earned the honor last year on March 27. Is Beatrice Llano the next best thrower to come out of Arizona State? Time will tell, but Llano made quite the splash this past weekend at the ASU Invitational. Beatrice Llano throws 71.43m/234-4 feet in her ☀️😈 debut!!! Llano won the event title in a hammer throw with a heave of 71.43m (234-4), which made her the seventh best performer in collegiate history. Not only that, but Llano had four other marks that eclipsed the 68.00m (223-1) barrier, including her second best effort of 70.14m (230-1). This is the third year in a row that a Sun Devil thrower has been named National Athlete of the Week during the outdoor season (Maggie Ewen took home the honor in both 2017 and 2018). Abraham Seaneke is a National Athlete of the Week after posting some of the best marks in the nation in the long jump over the weekend across all levels, including NCAA DI. The senior had the fifth and sixth-best performances in the long jump this past week by a collegiate athlete after a 7.64m (25-0¾) and 7.63m (25-0) showing at the Fearless Champion Open. It was the former mark that won him the event title. The Kokrobite, Ghana, native becomes the first male and second athlete overall to get selected for the National Athlete of the Week award in program history. CeCe Telfer is a National Athlete of the Week recipient after posting two national leading times at the UTA Bobby Lane Invitational this past weekend. The senior won both the 200 (24.30) and 100H (13.72) against a field of DI athletes. Both times lead the nation at the DII level. The Lebanon, New Hampshire native is the first athlete in program history to be named National Athlete of the Week. Over the past three years, only three men total have cleared seven feet in the high jump during the NCAA DIII regular season. If that one-a-year trend continues, then Jacoby Wolfe already got that mark out of the way this past weekend at the Westmont Collegiate Classic with Jim Klein Combined Events. Wolfe won the event title on his first clearance at 1.95m (6-4¾) and went over 2.00m (6-6¾) and 2.08m (6-9¾) on the first attempt before trying his hand at 2.14m (7-0¼). He fouled on the first attempt before soaring over the bar on his second try. This is the first time that Wolfe was named National Athlete of the Week during the outdoor season and is the second year in a row that George Fox has had a male athlete take home this honor (Seth Nonnenmacher on April 24). Annie Wright is now only one of two women who have scored more than 5300 points in the heptathlon in NCAA DIII history. The other is Kim Oden, the divisional record holder. Wright starred at the Westmont Collegiate Classic with Jim Klein Combined Events this past weekend as she totaled 5307 points, the most scored by an NCAA DIII woman in the past 27 years. Oden eclipsed the 5300-point barrier twice back in 1992. This is the first time that Wright has been named a National Athlete of the Week during the outdoor season and the third time in the past five years that the Bruins have had an honoree (Sarah King took home the distinction last year, while Asia Greene was honored in 2015). Jonathan Ply is a National Athlete of the Week honoree after posting one of the best performances of all-time in the decathlon this past weekend at the Mesa Combined Events Invitational. The sophomore won all but one event (where he finished second overall in the 100) to amass 7131 points, which is the seventh-best performance all-time in the event in NJCAA history. The mark also currently leads the next closest athlete by almost 2000 points. Ply is the seventh athlete overall (and third male) to win the National Athlete of the Week award in program history. Devia Brown has continued her impressive start to the outdoor season as she picked up her second consecutive National Athlete of the Week selection after she continued to rewrite the record book at the Distance in the Dark Invitational over the weekend. The sophomore posted best throws of 16.86m (55-3¾) in the shot put and 50.80m (166-8) in the discus, both of which lead the nation at the NJCAA level. The showing in the shot put gave Brown the third-best performance in the event of all-time and the mark in the discus tied her for the 10th-best performer in the event in JUCO history. As if that wasn’t enough, Brown also now sits second in the NJCAA in the hammer after a best chuck of 54.21m (177-10). She won all three events at the meet. Brown is the first woman to be named National Athlete of the Week in back-to-back weeks since Iowa Central CC’s Adva Cohen won the award three consecutive weeks during the 2018 season. Joshua Barker-Ortiz is a National Athlete of the Week honoree after posting top marks across three events at this past weekend’s St. Joseph’s College Spring Opener. The freshman ran the best time so far in NJCAA DIII in the 100 (11.22), is now ranked second overall in the long jump (6.37m, 20-10¾) and is fifth-best in the 200 (23.98) in what was a busy weekend for the standout Shark. Barker-Ortiz is the third male and sixth athlete overall in program history to capture a National Athlete of the Week honor. Elisia Lancaster is a National Athlete of the Week selection after the sophomore almost took the NJCAA DIII lead across all three throwing events this past weekend at the Stockton Invite. Lancaster is currently first in the nation in both the hammer (48.97m/160-8) and discus (37.22m/122-1) to go with being the second-ranked athlete in the shot put (12.25m/40-2¼). She won the hammer throw event and finished second in both the shot and discus at the meet. The standout sophomore has been a mainstay as a National Athlete of the Week honoree as this is her fourth award overall for her career during the outdoor season.